Danny Dorling – 丹尼·道灵 » News » Which children in Britain will have no holiday this summer? Which children in Britain will have no holiday this summer? The majority of the poorest fifth of children living in the UK have no summer holiday – or any holiday at all each year – and this has been the case for at least a decade now. However people are now learning to lower their expectations. When children in the UK are grouped into five equal sized groups, 50% of the families of the poorest 1 in 5 of all children report that they cannot afford to take a week away on holiday where they go away from their home and don’t stay with family or friends. They say they would like to do this, but simply cannot afford to. These children have no holiday at all, not just during the summer months, they have none at any time of the year. Some 45% of the next fifth of children, almost half of all those whose families live on modest incomes, cannot afford a holiday but would like to have one – just one week away a year. Over a quarter (27%) of children living in households receiving average incomes cannot afford one holiday a year. More than one in seven of children in affluent households in the UK, in the next fifth cannot afford a holiday – their parents’ income may be over-average but it is also very possible that their housing costs, the rent or the mortgage, are just too much to also be able to afford to have a holiday now. 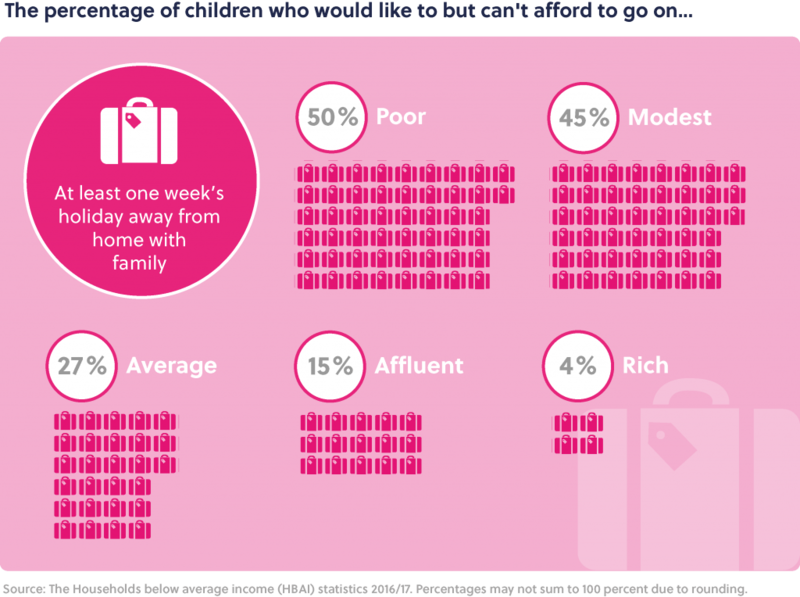 And finally, remarkably, one in 25 children in the richest fifth of families in the UK say that they too would like, but cannot afford one week’s holiday a year. It is very possible that their outgoing are also too much in one particular year. Or they may not consider the cheapest of holidays a suitable holiday. Percentage of children who would like to but can’t afford to go on holiday for a week, latest estimates. If you were wondering which group your family is in then take a look at the graphic below. It shows the average median household incomes for each of the five groups of families in the UK from the poorest fifth to the richest fifth at of 2016/2017. These statistics are for household total income before tax is deducted and before housing payments are made. They are the total of pay and benefits received each year by everyone in the household (adjusted for household size). If you live in a household that relies on an income of around 12,000 pounds a year to live on, 1000 pounds a month, you are in the poorest fifth of households. 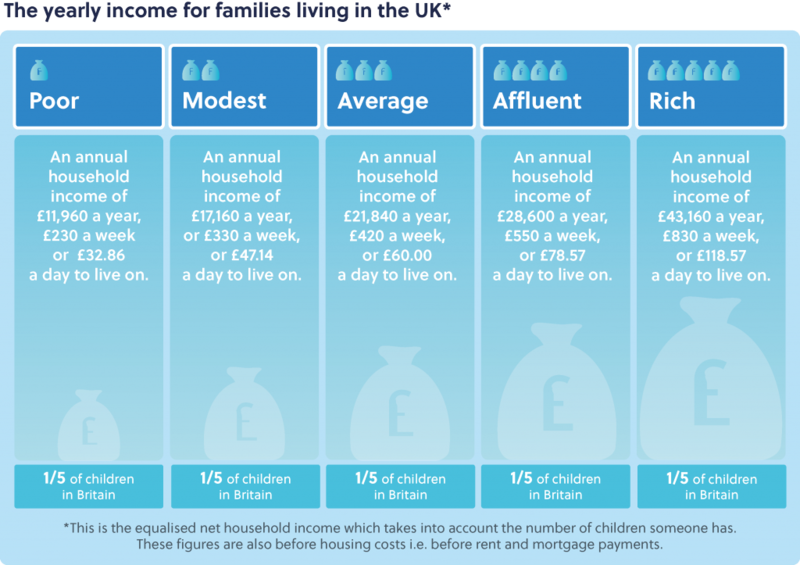 However, if you or your parents have a combined income of around 43,000 pounds a year, then you are an average member of the richest fifth of families with children currently living in the UK. Very few adults, let alone children, are aware of just how little or much money different families have to get by on today. The UK is most most economically unequal country in Europe. Over time the proportion of families who have said that they want a holiday but cannot afford one has been falling. This is not because families have been becoming more affluent, we know from other sources that average wages have fallen and benefits have fallen in real terms. It is also not because holidays have been getting cheaper, as that has not happened. Sadly the reason behind the trends, shown in the third and final graph below, is that fewer and fewer families now think of having a holiday at all. They have become used to not having one. When asked if they would like a holiday they reply ‘no’. Perhaps is better not to keep on wishing for what you cannot have? I am very grateful to Matt Barnes of City University for supplying the graph below. 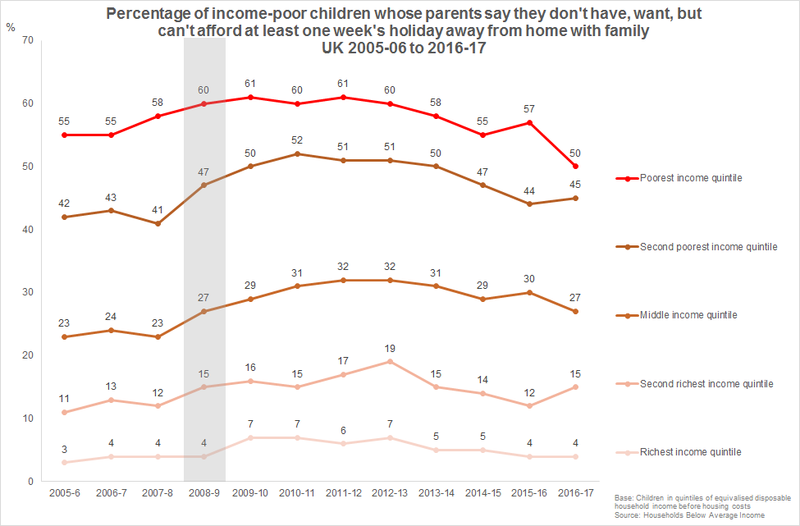 Proportion of children whose families say they want, but cannot afford, a week’s holiday a year, 2005-2017.